Fes /Fez is a wonderland of shopping, with the endless shops in the medina. Here are a few shops of particular note. It is always expected that you will bargain over prices in the markets, but in most shops bargaining is also widely practiced. Most shopkeepers give discounts if you buy more than one item, and give a greater discount with each additional item purchased. We will start our Tour by visiting 7 Gates of Fes’ Royal Palace, or the Dar el-Makhzen ,with it’s famous, beautiful brass doors & Surrounding the doors is tile work, or zellij, and carved cedar wood . these gates introduce to us Three main materials « Brass, zellij ,Wood » used a lot in the Construction of Fes related by three main Craft . We will visit the Workshop of Art Naji ,This family-run business creates pottery since generations. Their beautiful products are well-known in the area and from vases to plates and cups you can get everything within the authentic shop.is an exceptional place for traditional ceramics and pottery where you can see the craftspeople designing and creating the pieces. This is definitely worth a visit.. Take your time and get a good look on the mosaic and painted ceramics. You might even find a piece to take home. During the Tour inside the Medina you Get the chance to visit the world's oldest tannery to see how high quality leather coats, shoes and bags are made without using modern machinery. Learn more about the symbols and color combinations of the decorative carpets and rugs. Hear how they differ according to which Berber tribe produced them. 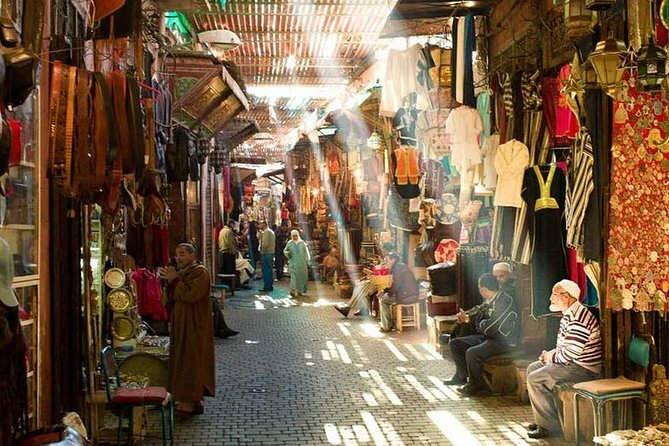 We visit also Place saffarine , Souks including ; Souk el Henna ,Souk Attarine, one of the liveliest in the city and you will have the opportinuty to Meet local artisans . See beautiful items crafted from wood and admire the ornate doors of the medina. Visit the Nejjarine Museum of Wooden Arts and Crafts, located in a restored caravanserai for travelling merchants. Batha Palace now a museum of arts and traditions ,also Mellah and the 17th century Ibn Danan synagogue,We will visit one of The vast collection of antique furniture, Jewish artifacts and treasures will delight collectors and art lovers. The owner can tell you a story about each of the objects in the store and can help you with your choice. Even if you don’t want to buy anything, the gallery is worth visiting for its outstanding interior and curious offers..